With high demand for living spaces in urban areas in Goa, real estate developers do not provide with large spaces to cook in. An average size cooking area in most constructions is around 25 to 27 m² and many will argue that this is too small for their liking. However, there are plenty of customized touches you can add to small sized area to make them beautiful spaces to cook in. Downsizing the entire area is a great place to start, as even with the limited space available, there isn’t a lot of room for prepping a meal. The first area that acquires attention are fitting in all your must-have appliances and work areas in the space available. You may have to scale down the size of your appliances or use innovative appliances that are built for multiple tasks. Opt for a single sink, double burners and a smaller microwave. The idea here is to have all the counter space you can get in a limited square footage. Tight spaces may not give you enough room after you put in your overhead cabinets and storage shelves. Consider opening up the cooking area to undo the claustrophobic look and combine it with another area such as the dining in your home. Incorporating glass across the space will give it a feeling of spaciousness and make the room appear much larger than it really is. Glass door cabinets or even a glass counter top can visually expand the limited space in your cooking space. Another aspect to pay attention to is lighting. Go for a combination of fluorescent lighting along with pendant lights and even play with the warmth of color. Incandescent lighting can be used on shelves over the counter space and also on overhead areas shining towards the counter tops. During constructions phases also consider better ventilation to the small space if you have a balcony adjoining window. It is recommended to have at least two windows inside the cookery that will facilitate better lighting and also get rid of cooking odors. Service balconies could also be utilized to store fridges and dishwashers or even your washing machine. Keep a provision for a sink in this area if possible. For the wall paints and also for the color combination of your cooking area stick to pastels or light shades. The more the white light that you plan in this area are combined with lighter colors, the larger your small space will larger. With urban homes getting smaller and smaller due to rising costs, the space for an ideal cooking gets even tighter. Many real estate developers across Goa have been providing an attached balcony to the cooking area as this is exclusive of FAR. 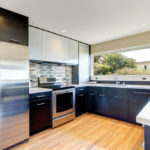 Although it is not within the rules to combine this area along with your cooking space, if used properly, it can house plenty of your appliances and also stack up storage units.